Rainbow Serpent | Sea Horse, run! Weedy Sea Dragons are widespread along Australia’s southern coast from Sydney on the east coast to the Perth region in the west. They are especially abundant in shallow, weedy areas, but “Weedies” have even been found as far south as the southern tip of Tasmania. Their color and leafy appendages vary depending on their environment and diet. Weedies can grow to one and a half feet in length, and specimens in captivity can live well over ten years. The mating season for the Weedy Sea Dragon begins around October or November which is Spring in Australia. Following an elaborate mating dance, a female will lay her eggs on the underside of the male’s tail. The male Weedy carries 250 to 300 eggs under his tail, and the eggs hatch in about two months. The following BBC video shows the mating ritual of a pair of Weedies in their natural habitat. Weedies are almost fully grown after one year. If the tanks are deep enough, this species will breed in captivity; as a result, Weedies are becoming more common in aquariums. Most specimens found in aquariums were tank-raised in Victoria. Wild adults do not adapt well to captivity and are likely to die after capture, whereas young, tank-raised specimens easily survive transport. Sea dragons are classified in the family Syngnathidae (pronounced sin-NATH-ih-dee). Every animal in this family is a fish. Syngnathdae is Greek for “fused jaws” because the mouths of fish in this family do not open or close. About 330 species of Syngnathidae have been classified. At least thirty-seven species are sea horses, three species are sea dragons (leafy, weedy and ribboned), and the rest are pipehorses or pipefishes. 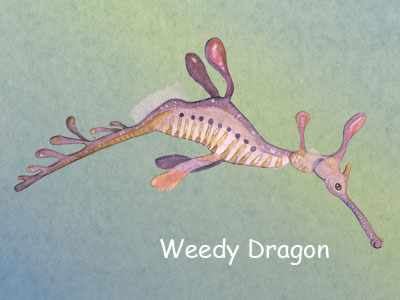 The vast array of brilliant colors (red, yellow, orange, blue, violet) combined with the lines and dots often exhibited by this species make the Weedy Sea Dragon a candidate for the “Rainbow Serpent,” one of the most revered ancestral spirits of Aboriginal folklore. Seahorses, Pipefishes, and Their Relatives: A Comprehensive Guide to Syngnathiformes by Rudie H. Kuiter. 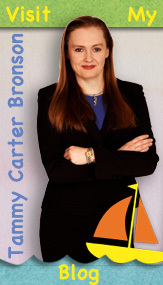 Copyright 2000, Revised 2003. Published TMC Publishing, Choleywood, United Kingdom.